This is kind of an intriguing album. Some of these songs are new. Many of them, though, are unfinished gems from different periods of the band’s career. While I say “unfinished,” I mean that before this album they were unfinished. These were pieces that were basically sitting on a shelf. The group brought them out, dusted them off and finished them. This is a solid album, overall. There are a few songs that don’t work as well as the rest to my ear, but really can’t you say that about most discs? This track is kind of the “odd man out.” It feels very much like a Southern rocker. The vocals tell you that it’s Scorpions, but the rest of the song doesn’t really seem like it is. This feels like something that could have come from the classic era of Scorpions. It’s basically a power ballad. It’s also trademark Scorpions. It’s anthemic for sure. Speaking of anthemic, this is the kind of arena metal tune that everyone thinks of when they hear the name “Scorpions.” It’s nothing earth shattering, but it’s strong stuff. It’s perhaps closer to something like the Lovedrive album or Animal Magnetism. This song finds them in fall ballad mode. It’s powerful and quite pretty. This definitely feels like something from Love Drive, with perhaps a little “Steamrock Fever” in the mix. It’s also got a bit of a Kiss riff at one point. Felling a lot like something from Blackout, this is a hard rocking and catchy tune. It’s one of my favorites here. This anthemic rocker is very catchy. The guitar riffs are meaty, too. Less of a metal cut, this is more straightahead rock music. It’s got a great chorus. It’s not one of my favorites, though. It almost feels more like Bryan Adams than Scorpions. This is definitely more like it. This screamer is definitely metal. It’s also one of the best songs here. It’s fierce and fiery. It makes me think of older Scorps, like Virgin Killer. Here we get more of a power ballad type song. This is far from the most metal thing here, but it does have some crunch. I definitely dig the guitar solo. I really love this song. It’s part metal and part bluesy hard rocker. The verses are more stripped back and it rocks in earnest on the choruses. This is one of the highlights here. Another ballad, I love this song. It’s intricate, evocative and incredibly pretty. I’m not a huge fan of this song. It feels very much like an AOR 80s rock song. It’s good, but not as strong as a lot of the rest. It doesn’t really feel like the Scorpions. Instead, it seems to have a very generic sound. Now, this is great. It’s hard rock merged with metal. It’s fast paced, high energy and full of great tones and sounds. The hooks are accessible. This feels like something the band might have done in the classic period. It’s definitely one of the standouts. Here is another highlight. This is a soaring power ballad styled cut. The metal movements are particularly crunchy. There are almost hints of progressive rock here, too. This is accessible and yet meaty. There is a lot of magic and drama here. This is another ballad. It’s also another of the best songs. This is quite pretty. The wall of vocals on the chorus is great. The whole song is just very evocative. More metallic, this is very much classic Scorpions. It’s another strong cut on a disc with a lot of strong material. 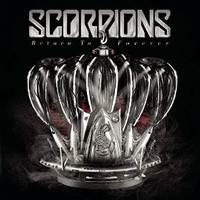 An anthemic metal rocker, this is also classic Scorpions. A harder rocker, this has some great riffs. It’s another standout.